1976 Topps Welcome Back Kotter trading cards are one of the simplest releases of the era. With a small checklist and no stickers, it's both basic and affordable. Based on the popular sitcom starring Gabe Kaplan and a young John Travolta, the set has just 53 cards. Done in a similar style to 1975 Topps Good Times, card fronts use shots from the show. Comic-style speech bubbles add corny jokes. Backs add more dialogue in the form of "The Sweat-Hogs Speak." Given the small size of the set and there are no stickers to chase, 1976 Topps Welcome Back Kotter isn't overly difficult or expensive to complete. If you're not overly picky on size, complete sets are readily available for under $30. Singles and even packs aren't overly difficult to find, even after all this time. 1976 Welcome Back Kotter Trading Card #6 "Can Mr. Kotter come out and play?" 1976 Welcome Back Kotter Trading Card #15 "But why can't I pledge to Brooklyn?" 1976 Welcome Back Kotter Trading Card #13 "Woodman charged me with Cheating. ?" 1976 Welcome Back Kotter Trading Card #37 "Darn we gotta let her play "
1976 Welcome Back Kotter Trading Card #26 "Too bad they havn't got a course i?" 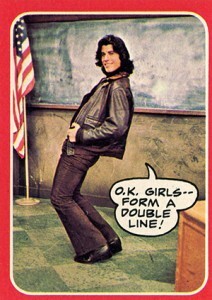 1976 Welcome Back Kotter Trading Card #52 "But how can anybody fail lunch?" 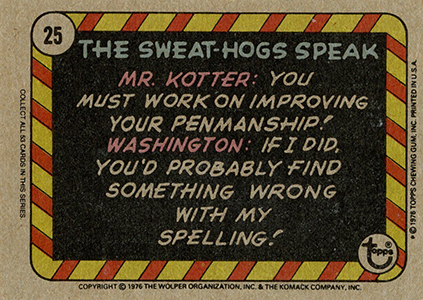 1976 Welcome Back Kotter Trading Card #16 "You sweat-hogs are a bunch of lazy.."
(1) Unopened Wax Pack 1976 Topps "Welcome Back Kotter"
53 cards. Shop for sets on eBay. 1 Up your nose with a rubber hose! 2 Gabe, when you take out the garbage, don't forget Horshack! 3 Three o'clock and all's well! 4 I've heard of homeroom...but this is ridiculous! 5 This is the happiest day of my life...Saturday! 6 Can Mr. Kotter come out and play? 7 Cheer up Mr. Woodman...us Sweat-Hogs will never leave ya! 8 Who said I looked like a penguin? 9 To be or not to be...a Sweat-Hog? 10 I thought you said doing the hustle was easy! 11 Horshack you don't have an inferiority complex--you're genuinely inferior! 13 Woodman charged me with cheating! Yeah? How much? 14 You'll look sexier if you wipe your nose! 15 But why can't I pledge to Brooklyn? 16 You Sweat-Hogs are a bunch of lazy, sloppy loudmouths...but nobody's perfect! 17 I went to the playground--someone stole all the hoops! 18 There's a school bus leaving in 20 minutes--try and be under it! 19 I'd throw you a kiss--but it's been a hard day! 20 Sorry I'm late--the school bus was hijacked to Cuba! 21 Schools have changed since your day--we don't kill students, we fail them! 22 Our report cards sunk--they're below "C" level! 23 Kotter wants to know where Asia is -- where'd you put it? 24 I failed French--it's all Greek to me! 25 O.K. girls--form a double line! 26 Too bad they haven't got a course in good looks! 27 I don't hate school -- it's just the principal of the thing! 28 You Sweat-Hogs should go far-- the farther the better! 29 Hail the honorary sweat-hog! 30 Me, me! Him, him! 31 From the shores of Montezuma to the halls of Buchanan High! 32 Today Buchanan High School -- tomorrow the world! 33 Which Sweat-Hog wrote his composition in invisible ink? 34 When I want your advice, Kotter, I'll rattle your cage! 35 How long can a man live with-out a brain? I don't know -- how old are you? 36 Ooh! Ooh! Ooh! Ooh! 37 Darn--we gotta let her play -- it's her ball! 38 This is one way of getting a balanced education! 39 Your Uncle Hershey did what? 40 Even in the new math, 2+2 doesn't equal five! 41 Horshack, your deodorant failed -- and you might too! 42 The meeting of the Barbarino fan club will now come to order! 43 Who said I'm all wet? 44 Other kids have teachers...we have Mr. Kotter! 45 You're in a class by yourself -- and I wish you'd stay that way! 46 Horshack, nowadays charm and intelligence just aren't enough! 47 Do you feel like a glass of juice? No -- do I look like one? 48 The Three Musketeers... ...one for all... ...and all for lunch! 49 Mr. Kotter says he can't teach us anything -- we must be geniuses! 50 Ooh! Ooh! Ooh! Ooh! 51 I was gonna cut class, but someone stole my pocket knife! 52 But how can anybody fail lunch? 53 In this school you've gotta be crazy...or you'll go nuts! 1976 Welcome Back Kotter Wax Pack Fresh from Box L@@K!